If you use Instagram regularly, you must know that the social photo sharing platform Instagram can also be a good way to earn money. Yes, the all you need to do is share photos with your followers. The same thing you regularly do on the platform. The only condition is to have a good number of followers on Instagram. The more number of followers you have, the larger amount of money you can earn. So, you have to be regular, post good content and engage with your followers. If your Instagram account has good number of followers and engagement, You must read this blog post to learn how to earn money from your Instagram account. Before you start monetizing your Instagram account, you must do these things first. Fill out your bio with all the right information. Include what you are and what you post about. Also, add few relevant keywords with hashtags to ensure you are easy to find on Instagram. Be regular and try to post photos daily. This will help you in increasing the number of your followers on Instagram. Take care of the quality of photos you post. You can buy a good camera phone of good DSLR camera if you can afford. Make a habit of using relevant hashtags in your photos for wider reach. Always engage your followers. It will encourage people to be active on your profile and you will get a good number of reactions on your photos. Engagement matters a lot. 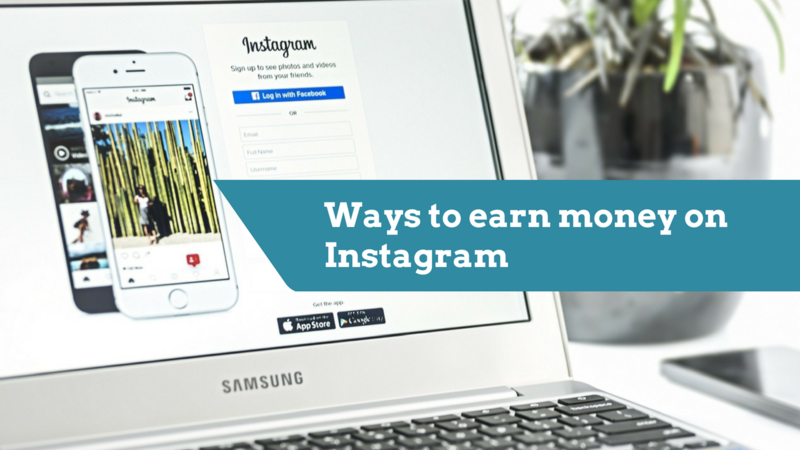 There are multiple ways to earn money on Instagram. In this article, I will explain most of the working ways. There are several brands ready to advertise their products on Instagram. If you have a good number of followers, they will surely be ready to pay you to post about their product. But be sure to select the product that suits your profile. You must always post about the product you can use or relate yourself. There are few online marketplaces that connect Instagram users to sponsors. Tap Influence, Instabrand and Ifluenz are few most widely used platforms for this. You can signup there are then look for available opportunities. brands can also easily find you and ask you to be a part of their next marketing campaign. Affiliate Marketing is another good way to earn money on Instagram, but it is not as good as it works on other social media platform. The primary reason for this is that Instagram does not allow clickable links on post description. So, you are bound to put a link in your bio and you can only promote 1 link at a time. Be the part of affiliate program of different products. Shopstyle, Amazon, Sharesale and various other platforms allow you to become an affiliate, promote their products and earn money. Post a photo of a product and recommend people to buy that from the link available in your bio. See the below example how GlamourZine promoted knee boots. There are few other less recommended ways including selling your account. I do not recommend selling your account. I recommend you to be a brand on Instagram and then see how other brands will approach you to talk about their products. Instagram is growing fast with increasing number users. So, brands are now actively promoting their products on Instagram and looking for Instagram influencers. Try the above ways and join the marketplaces where you can get brands ready to offer you their campaign and pay you for posting photos.